Digimon World: Digital Card Arena (デジモンワールド　デジタルカードアリーナ, Dejimon Wārudo Dejitaru Kādo Arīna) is a video game. It is the successor of Digimon World: Digital Card Battle and is based on the anime series Digimon Adventure and Digimon Adventure 02. The story begins when the player enters the peaceful Digi-Land. It did not last long as several Digimon begin to act differently and goes on rampage, caused by the evil according to a mysterious Digimon. At first, it was believed that it was caused by the Digimon Kaiser, who actually is a human that was manipulated by the evil. It turned out that the source of evil came from A in Infinity Tower, who hacked the entire system of Digi-Land. Then, a mysterious Digimon that is revealed to be Rosemon encouraged the player to challenge A to save the Digimon and Digi-Land from the evil. After the player beat the game, A was trapped and hijacked from Digi-Land caused by losing at the card battle system created by Rosemon, and therefore brings peace to Digi-Land once again. In the post-game, the cities began to build their own Extra Arena and a new evil Digimon appeared. At this point, the player can challenge the Chosen Children and their Digimon partner, as well as their evolutions. After the player defeated the final evil Digimon Apocalymon, the player have to beat the Card Battle Masters, Black War Greymon and Black Metal Garurumon. The gameplay is similar to its predecessor Digimon World: Digital Card Battle. Some Digimon card artworks, specialties, stat points, and support effects are changed. In addition, there are 6 Partner cards with an EXP based system, which allows increases in HP or attack points when leveling up at certain levels up to 99. Partner cards also have Digi-Parts, which can be useful to change their support effect. The player can only have 3 Partner cards in his/her deck. Partner cards can evolve into a new Armor level by using Digimental that can be received from certain characters. Normally, the Armor cards have lower stats than Level IV cards and cannot be obtained by any means. Unlike its previous game, the cards cannot be bought. The player obtains three cards after defeating each opponent. The player can also create decks based on the opponent's decks if there are enough cards needed. A new feature, the Fusion Shop, allows two cards to be combined into a single new card, or simply exchange unneeded cards to increase a Partner card's EXP. There are 301 cards of total, ranging from 000-300. The player now can have a maximum of 7 identical card in his/her collection. There are seven powerful "7s" cards, as well as the rare-yet-useless 12 Digi-Jewel cards. Mega Area (メガエリア) is the southwestern area of Digi-Land. It is the first area that the player explores. Giga Area (ギガエリア) is the eastern area of Digi-Land. Tera Area (テラエリア) is the northwestern area of Digi-Land. One can only reach Infinity Tower in this area. 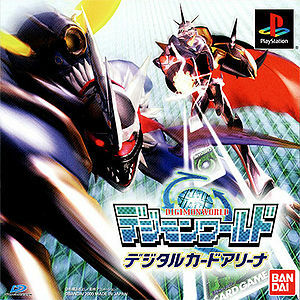 Several soundtracks from Digimon World: Digital Card Battle replace the original soundtracks in US version of this game, possibly to remove the Japanese anime theme references. 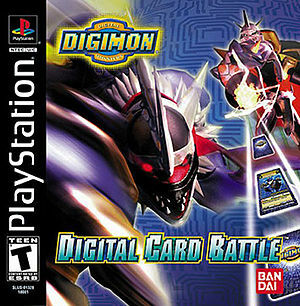 Even though the Ultimate level was well established by the time this game released, it did not feature it and every Ultimate level Digimon was treated as a Perfect level card that could evolve from Adult level Digimon naturally. This game came with the Hyper Colosseum card Dw-5 as a Bonus. This page was last modified on 19 July 2018, at 03:54.